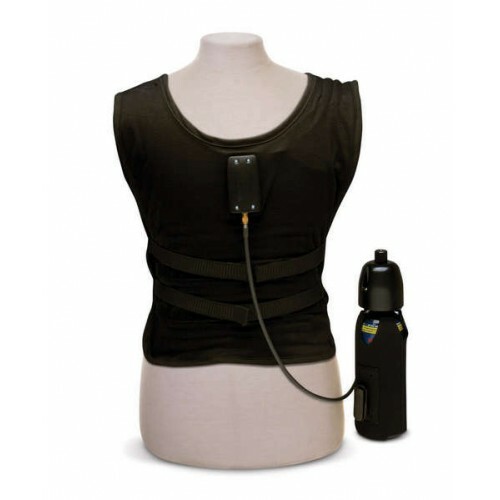 The World’s lightest untethered active cooling garment! The World’s only active cooling system that is safe to use in explosive environments! The World’s only active cooling system that can be worn inside of a fire protecting our nation’s heros from heat stress! Our newest product is the CoolShirt Porticool® 2 System which provides many new features never before available. Weighs of only 1.8 lbs total weight. Moisture wicking fabric keeps you cool and won’t weigh you down. Requires no ice or electricity and uses refillable liquid CO2 tanks. Fire rated material ISO 17025 and NFPA 2112 tested. View report. Provides one hour of constant cooling before switching out the refillable tanks. Our newest product is the CoolShirt Porticool® 2 system, which provides many new features never before available.